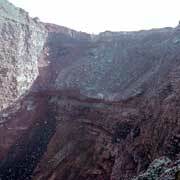 Looking into the crater of Mt. Vesuvius from a walking trail. It has erupted more than 50 times since the eruption in 79 CE, when it buried Pompeii and Herculaneum. The last time it erupted was in 1944. The height of the main cone has been constantly modified by eruptions but presently stands at 1,281 metres.